Young Investors!- Make money in Malaysia and Singapore! : Market Plunge- What's Next?? 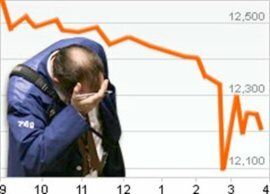 US Market Plunge- Global Panic?? I think the past few days was the most difficult period for a lot of investors out there. Most of my friends have many sleepless nights after the recent US market plunge. 1) Don't buy stocks using bank margin- Use your own money and NEVER borrow to buy stocks!! 2) Don't panic, when stocks go down, they will go up eventually as long as you ARE BUYING GOOD STOCKS! Hold on and wait a while, your stocks will go up soon! 3) Diversify- buy some stocks, properties, REIT, gold/silver, when one comes down another investment will go up certainly! 4) Earn and invest and never invest to live. If you do not have a fixed income and retired, put at least 80% of money in bonds/hedge fund or else you will lose all your money if you put everything in stocks when the market is bad! No worry when the market plunges because it provides you golden oppurtunity to hunt for cheap and valuable stocks!! Just Loved IT! very well constructed and inspirational! Would like you to see our project, because between artists we can support each other! who knows, just spreading the word is enough! hey guys is there away to contact you through email or something? Thanks.